This is my first post so please forgive me if I seem to ramble on. 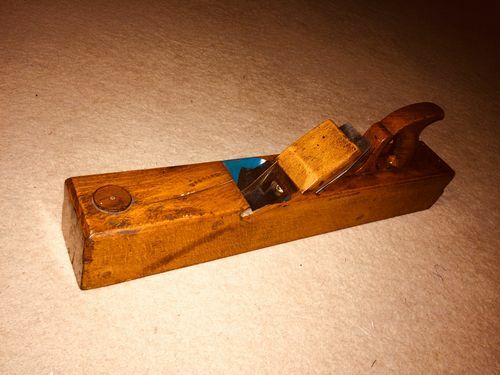 I just picked up an old wooden jointer plane and it is in need of a bit of work. So I’m here to ask for your help on how to go about it. 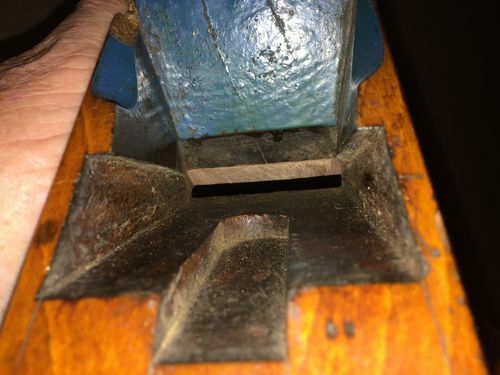 It has a couple of cracks in the body that have previously been repaired with dowels. It also has had a mouth closure repair. The base, along its length, seems reasonably good with only a 5 thou hollow 6” behind the mouth. That’s with the mouth closure insert removed. I can’t close the short crack in the base at the front and it hasn’t affected the flatness any. With regards the long crack in the base at the rear, I can only close it about 10 thou but it has caused unevenness across the base. 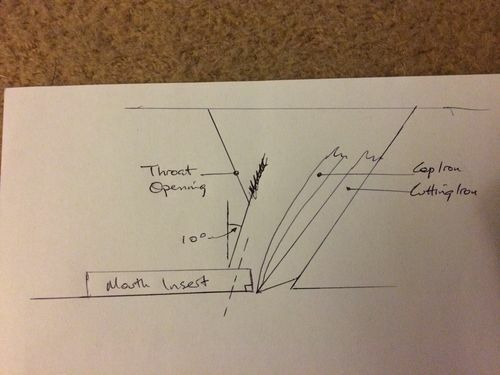 whereas the slope of the throat forward of the mouth is at about 10 deg off vertical. 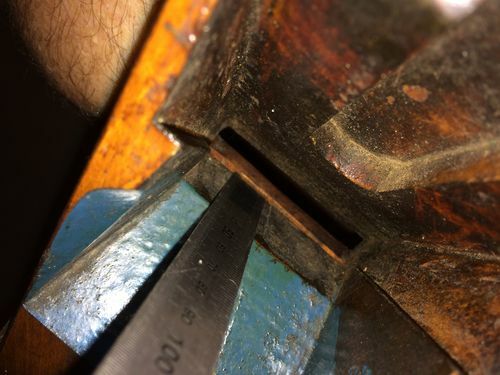 If the insert was fettled so that it was coincident with the throat (at 10 degrees), there would be a 2 1/2 mm clearance in front of the iron at minimum thickness shaving setting. I wonder if it was repaired (somewhat) and perhaps not used since. I’m hoping you might weigh in with your thoughts and how you’d go about the repair. Thanks with appreciation in advance. 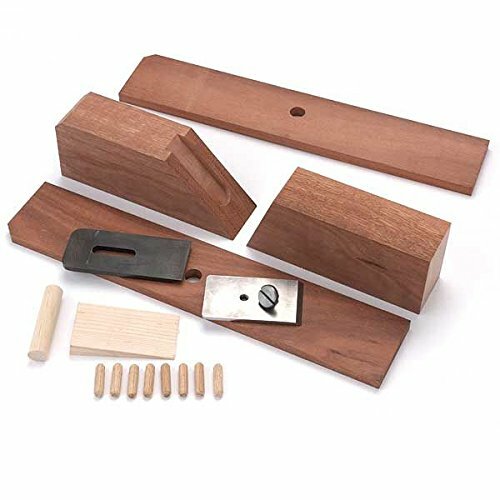 Maybe try your questions on the handplanes of your dreams thread. A lot of knowledge on that thread if you don’t get a response here. Yes that thread would be a good bet. How tight is the mouth when the blade is inserted. My guess would be that insert is done right for a tight mouth and you don’t want to open it further at your dotted line. That’s a pretty major crack so I don’t think you can do any more terminal damage trying the rest of your plan. I would put a new sole on it. Just an 1/8” of some tropical wood such as Bubinga or Jatoba would add many years of life. Do you think we could arrange a mouth closure repair on several dozen elected officials? Thank you all four for your input. This is a real learning experience for me. It will be a user when finished but will probably only ever see a tiny fraction of use of that it has had over its life so far. Bondo, I think I’d like to try my hand at reviving the old girl in what I perceive to be a purist’s manner rather than laminate the sole. 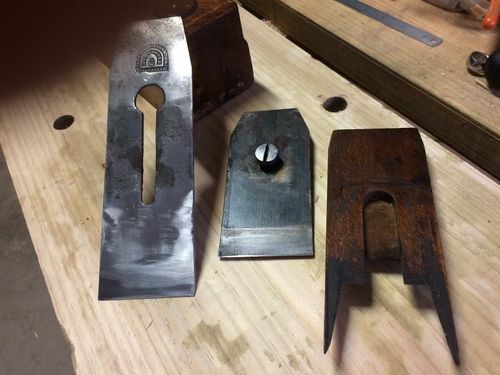 Tim, I’ve squared the iron’s cutting edge and when set square to the sides and parallel to the front throat face, and when set to zero cut setting on one side, there’s about 5 thou protrusion on the other. This is measured off the back of the mouth as the mouth insert sits proud of the sole. In this configuration, there is .025-.028 clearance between the iron and the back of the insert when the gauge is at the 10 degree throat face angle. 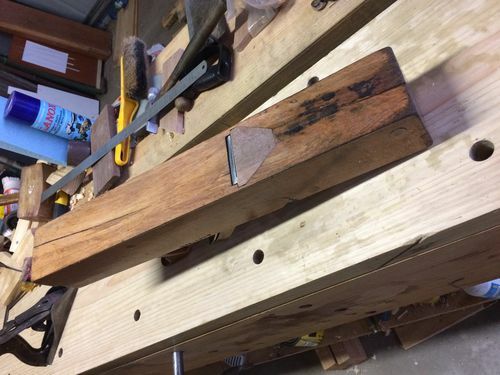 I guess the question I should be asking is “what size opening should I be aiming for?” I read an article by Caleb James – http://kapeldesigns.blogspot.com.au/2014/03/keep-that-mouth-shut.html – suggesting something like .030” for a jack plane. Never having used a jointer before, would .030” be ok or something less? 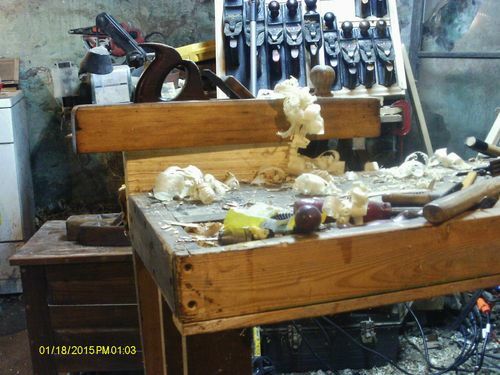 Or does it depend on what you’re making and out of which timber? I will mostly be using pine and making furniture, beds, cupboards and the like. I think the more I write about it, it becomes more obvious what I should do. (Thanks for the eye opener Tim. ) Glue the insert back in. Fill in the cracks. Flatten the sole. Use it. Overthinking ain’t all it’s cracked up to be. Don, with 15 times the population of Aus., you’ve got a lot bigger problem than we do, and a lot more fake news too. I agree with the sentiment but I’m not your man. Good luck. If you think the cracks will continue to widen, then your epoxy idea will work. If you think they are done splitting, I’d suggest using a colored wax instead. Making a new mouth insert is what I would do as well. Make it as tight as you can. 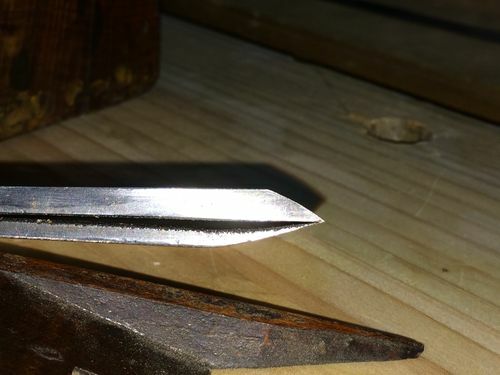 Its easier to widen it as required, but Making is narrower is a complete redo. You’re off to a great start. 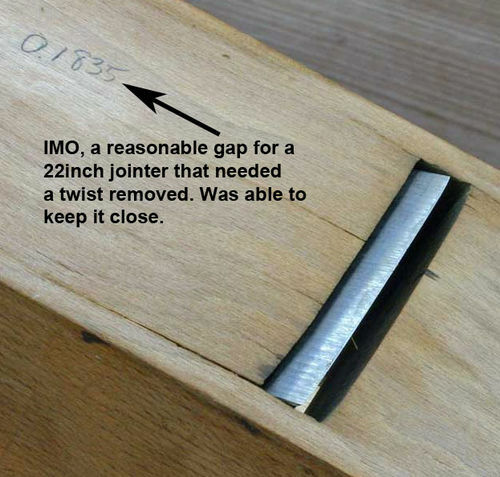 A jointer Only needs to be reasonably flat. The tighter the mouth, the thinner the cut. Hi Don. I think the cracks are stable. Is the ‘wax only’ for appearance? How about epoxy kept shallow with wax to finish, covering both bases? I might go for the new insert, tight as you suggest, and figure it out as I go. That way I get practice at making infill pieces & stuff with precision. Win win. I’ve used epoxy with good success but remember wood moves, so use your best judgement. 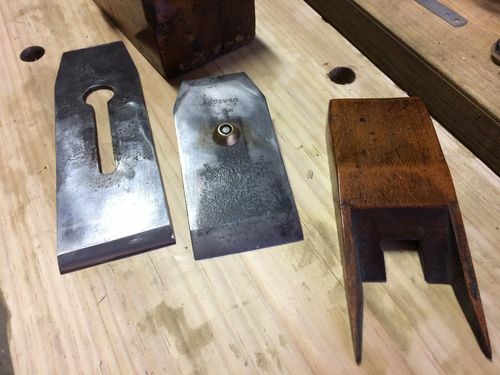 Personally, I would really consider resawing/cutting off the sides the sides of the plane and building a “new” plane similar to a HOCK plane kit. I say “similar to” and not exactly like that pictured below. 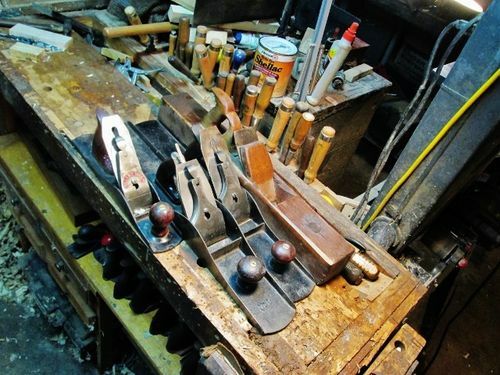 I would say keep your original “wedge” and blade, then cut and build a new plane body around that. 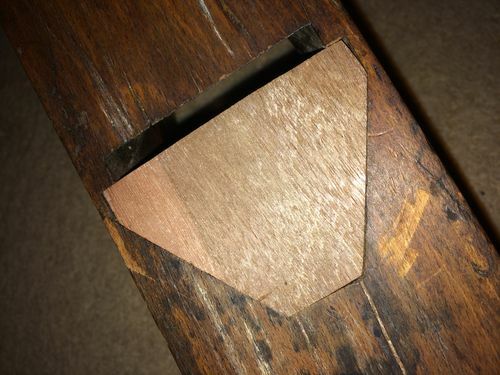 The angles should be easy to cut, and once that is done, then you can glue the sides back on. 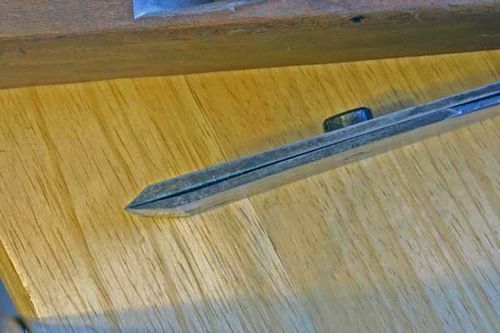 FWIW, I have an old 22in Auburn Tools wooden plane and just love that huge chunk of metal for a cutter. Just an idea. Good luck in whatever direction you choose to go. Mike, I’d like to keep the tool as original as possible. A lamination is a plan for the future, probably in a grooving plane. So for now, for me, small steps. Thanks for weighing in. Actually, I have had two. The one with a from knob was a No. 81…...the second one? Been used a bit, ever since..
Part 1 of the repair. The new mouth closure insert in place but not glued in yet. I had to square the walls of the recess to accept the new piece. Couldn’t be happier so far as there is absolutely no movement of the insert. 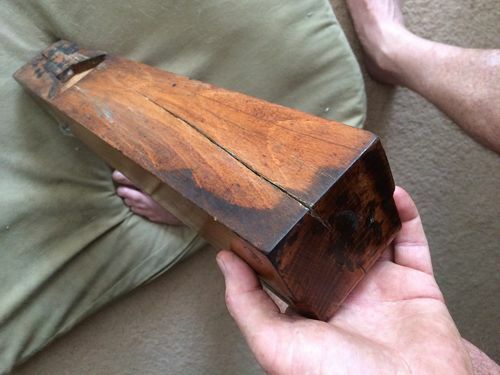 No idea what wood it is. 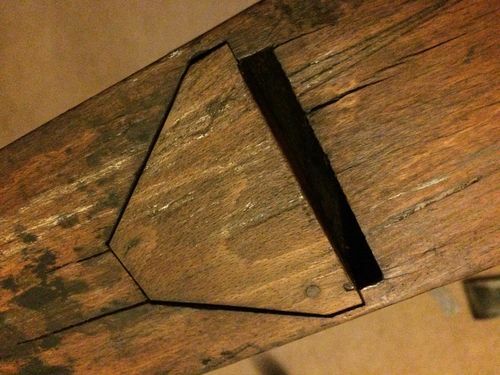 It’s from a pallet slat. Part 2 will be to fill cracks with epoxy and glue the insert in prior to flattering. Looks real good thus far! Any twist in the base? 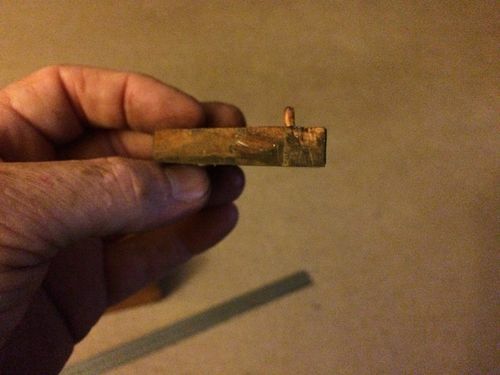 Mine had a slight twist, but judicial use of my 8in. powered jointer I was able to eliminate my twist and managed to keep my mouth gap within limits without doing a lamination/insert, as yours requires. Keep us informed as you complete this! Ok. So I got impatient. Mike, I flattened the sole and took out the slight twist with my #4, then spent about 1 1/2 – 2 hours flattening the back of the iron and another hour + to sharpen it. I took to the mouth (still not glued in) with a file, enough to be able to get a shaving, installed the iron and took to my bench top. This plane is a delight to use. I think Alex Mathieson would be pleased with my repair. Makes me wonder though. 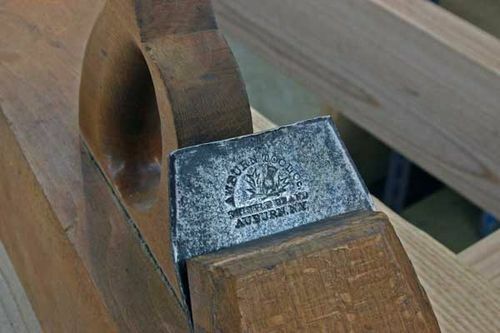 Why hadn’t the back of the iron been flattened in the past 100-150 years? Now all I have to do is glue the insert in and fill in the cracks, job done. I would not use epoxy. 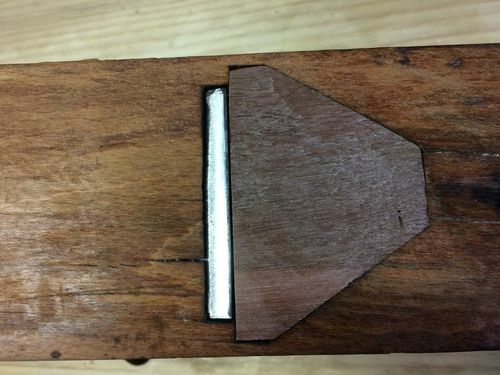 Wood moves, Epoxy does not. If you want to use epoxy you should seal the whole plane, which I think is not your idea, as you want to keep it as original as possible.